Advice From A Risk Detective: Writing a book. Once you become an executive, you are prized for your ability to write short and sweet, in paragraphs that form an executive summary that other executives can understand. In the past two years at Annie Searle & Associates LLC, I've continued to write short pieces, either monthly columns or research notes that are 300 words or so. Now I'm coming down to the wire on a book manuscript for which I have created deadlines that back up to the Northwest's largest book event, the Northwest Bookfest on October 1-2. 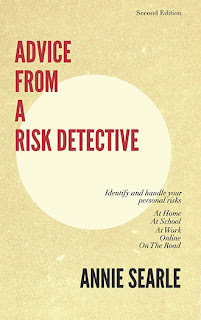 The name of the book is Advice From A Risk Detective: At Home, Online And On The Road. The book stems from a desire to influence a larger audience than I can reach in my professional work with corporate clients.I want the book to be small and handy, a reference book rather than a scholarly work. It's written for you and everyone else you know, in plain English. It discusses how to handle your personal risk at home, at work, on the Internet, and in the world while traveling. And things are coming along pretty well, except that I can't work on it full time at this point. Emily has been assisting me with the manuscript as a sort of zen master of Microsoft Word. Three specialists who helped build the ASA website are back in the saddle to bring in the best possible book -- Lauren has been working with me for nearly two weeks, reshaping some thematic elements in the book and directing the rewrites; Molly from First and Union will recommend final edits; and Jesse, who designed ASA's look and logo, will design the book cover and make the interior presentation exceptional. When everything is all done, we'll ship the book as a PDF to Amazon's new independent publishing service called createspace. I'll have a commercial bookpage on Amazon, and it will be printed and shipped within two business days of an order of any size. I do have to say that writing a book and growing a business at the same time have put me right at the edge of my comfort zone. This next month will be quite interesting as we find out whether my deadline is realistic. Either way, I'll be thinking through how best to manage my personal risk. Ten billion dollar disasters so far this year! The hardest part is done.